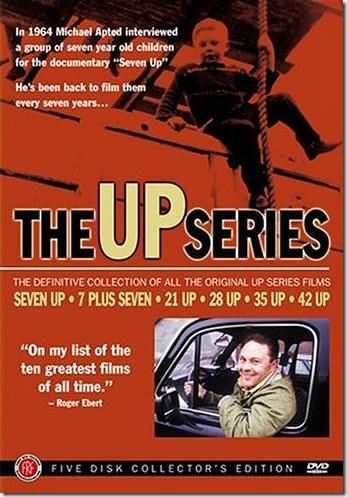 For the last day or so I’ve been watching a fascinating documentary series called the Up Series. It started in 1964 when fourteen children were interviewed at the age of seven. Every seven years since 1964 the participants are interviewed and a new installment of the documentary is released. It’s fascinating to watch as they grow older by seven years, have careers(or not), families, etc. I just finished 28 Up and it was bittersweet. It definitely has me evaluating my own life. I need to get moving with my goals! Seeing the wasted potential by some of the participants(at least at age 28) definitely shook me a bit. I highly recommend watching the series. All installments(49 Up was the most recent) are available through Netflix, and all but one of them are available to view online. I cannot imagine having to wait seven years to continue the story; I’m already getting apprehensive about finishing the series as it is now. Agh! 56 Up will not be available until 2011 or 2012! Watching them all in quick succession has allowed me to remember all of the details from 7 years old to 28 years old. It’s really very moving, but in some bizarre way I almost feel guilty for peeking in on these ordinary people’s lives. All in all, it’s a fascinating project and experiment and I highly recommend it. Five stars. PS If you’re on Netflix, let me know. I would love to take more advantage of the Social aspects of it.